Exports to countries outside the EU - saving 20% on our prices, simply select delivery to the USA or rest of the world and enter VAT in the Discount code box. You will then need to go to checkout and complete the delivery address details. 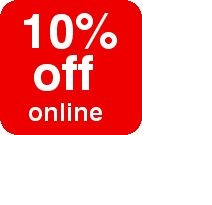 Our VAT discount will then be shown along side other discount offers. Please note that you may be liable for your countries duty when it enters your country - if in doubt contact the relavent department in your country. Should you wish to cancel your order, any goods supplied must be returned within 7 days of your notice to cancel or 7 days from your receipt of order. Providing the goods are returned in original condition with all packaging you will receive a full refund, less any delivery charges. Returned items must be unworn and, where applicable, returned with any packaging and all original tags still attached to the garment! All returns are the responsibility of the customer until received by ourselves, and we strongly advise customers use an insured delivery service. The cost of returning all items is the responsibility of the customer.